The beach and parks might be a bit chilly these winter school holidays, but that doesn't mean your kids have to get cabin fever. There's plenty going on around Sydney to keep everyone amused and entertained – including Mum and Dad. Hop to The Grounds of Alexandria for fun family gardening workshops, and a top notch coffee and pastry while you're there. 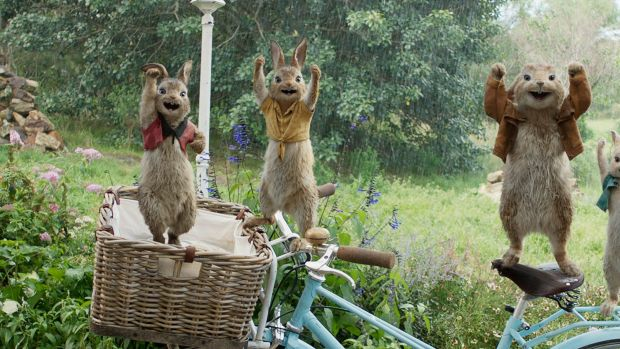 Inspired by the indomitable Peter Rabbit film, expert gardeners will lead children and parents through the gardening basics in the lush Atrium space. You'll learn how to plant seeds and care for vegetables so you can create an oasis at home, just like Mr McGregor's. If you've been to The Grounds, you'll know it's a one-of-a-kind institution that seeks to nourish both the body and mind. There's also family yoga and cooking classes happening there throughout the holidays, so the only challenge is working out how many days you can get there. Take the M4 to Penrith to give your thrill seekers a real adrenalin rush. Whether your kids pretend they're in The Matrix or that they're an acrobat or astronaut in space, once they enter the glass tunnel at iFly and are lifted up on the column of air, you can guarantee you'll hear them talk about nothing else for the rest of the holidays. Open to anyone from three years old, the "ride" is the closest thing a human can get to flying like a bird. All up, you'll be there for about an hour and 45 minutes, which includes instruction and two 50-second flights, with prices discounted mid-week. Your dinosaur-loving grommets will get a real kick out of a trip to the Australian Museum these holidays. You can expect eyes to bulge and jaws to drop as your troops explore the incredible dinosaur world of 65 million years ago. Ceiling repairs are underway for some of the usual dinosaur exhibition but there's still plenty of carnivorous dinosaurs and giant plant-eaters on display for dino-loving kids. While you're thinking about the prehistoric world, check out the Mammoths: Giants of the Ice Age exhibit that's running until July, featuring life-size replicas and an actual preserved baby mammoth who walked the planet 42,000-odd years ago. Head to Jenny's Painted Pots on the Northern Beaches for a bit of creativity and simultaneous mindfulness. You and your kids will peruse the porcelain wares then settle in with your paintbrushes to create a school holiday keepsake like no other. You can try your hand at a one-of-a-kind platter or teacup while your kids can go to town on animal figurines or a pretty pot. Leave your pieces to be glazed and fired to be collected the next week. If your kids are going bonkers indoors, then a trip to Flip Out is sure to release that pent-up energy. Scattered around Sydney's outer suburbs, the trampoline hubs are fun for both kids and adults who want to try their hand at a flip, somersault or trick. Ninja classes will take your kids' bouncing to the next level or they can just spend some time bouncing around and diving into the foam pit. The pools at Sydney Olympic Park Aquatic Centre are indoor and heated, making them the perfect place to park yourself on a winter's day. There's plenty on this school holidays, from diving and water polo clinics to the All Day Recreation Program, where Austswim instructors will take five-to-12-year-olds through a jam packed program of swimming, soccer, NRL and other sports for a whole day. Let your younger kids loose in the Splasher's Water Playground or sign your kids up to an intensive swimming lesson program. Artistic kids will love nothing more than a day at the Pine Street Creative Arts Centre in Chippendale. Each school holidays they run workshops, such as ceramics, print-making, drawing and jewellery-making, allowing kids to discover their inner artist and have fun with their hands. Bookings are essential, so keep your eyes on the City Of Sydney website for course dates. This article has been produced in association with Universal Sony.